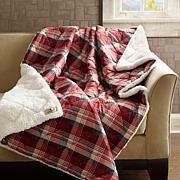 Enjoy the rustic look and cozy cabin feel of this soft ensemble that gives you two bedding options. 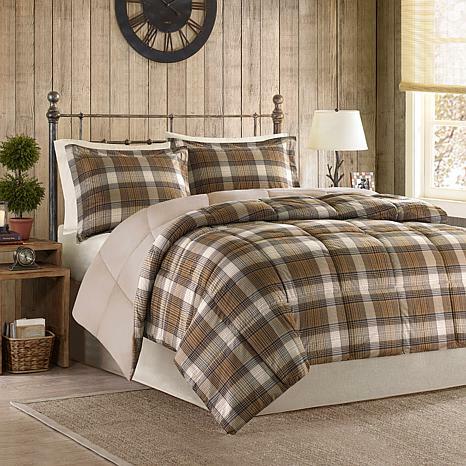 Have a picturesque khaki and brown plaid pattern one week, then flip the comforter for a beige brown look the next. A knife edge provides a beautiful finishing touch. You'll never tire of the great outdoors. I have a Queen Size bed so originally I bought a Queen Comforter...Since I have a Pillow Top Mattress the Queen size just seems too small..So bought a King and now looks perfect..I used the Queen in another bedroom on a Twin Size mattress.. The quality is so nice well worth having two...Recommend buying a size larger if you have a Pillow top Mattress.. I really like this set for my Bedroom. I have had the same set for over ten years now I changes because I found a set that fits my style. Nice.. Warm, soft and deep pockets fit well. Love them! This comforter exceeded my expectations! Love the colors and so incredibly soft! And very well made! I would highly recommend this product! Incredible Value and Exquisite Quality! This comforter is absolutely plush and beautiful. I bought it for my 18 year old son's room and would love to have it for myself! I was absolutely stunned when I removed it from its bag. It is so soft and comfy and absolutely gorgeous. Very rich looking and manly at the same time. Perfect.